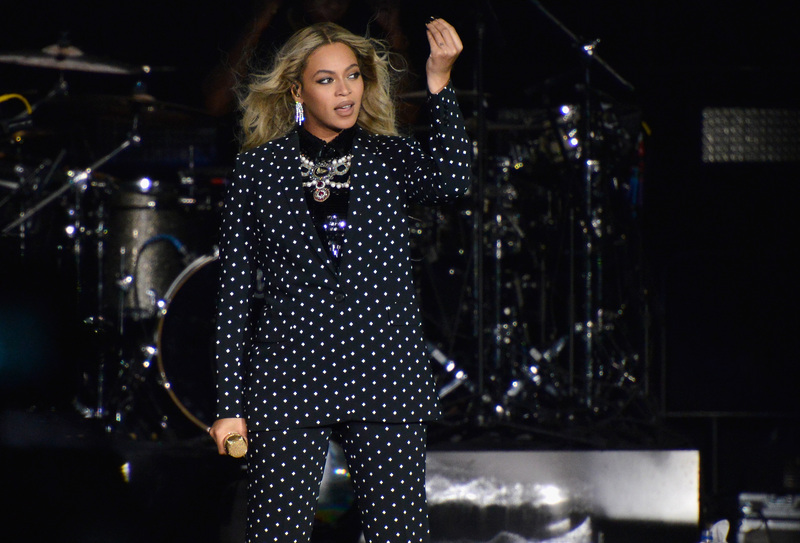 On Nov. 5, Beyoncé publicly declared her support for presidential candidate Hillary Clinton at the “Get Out the Vote” concert, and she did so while wearing a pantsuit — a boss move that was perhaps a nod to Clinton’s signature style. Here, a closer look at Bey's power suit. A pantsuit never looked so good. Beyoncé's exact outfit is both practical and powerful — Unfortunately, both pieces are sold out everywhere. While it's hard to bask in the glory of this Givenchy look without being able to get it yourself, assuage your pain by finding some similar silhouettes. Amp up your work attire with this metallic pink two-piece. You can never go wrong with a tailored navy suit. Make a statement with printed separates. Wear this metallic two-piece together or mix it up with simple black pieces. Rock this black suit at work with a classic white button-up or try wearing it with a silky camisole come night, for a look that reads Parisian chic. Add some color to your winter wardrobe with this sunny pink pantsuit. Mix and match this neutral two-piece or pair it together, either way it is bound to look great. Because khaki will never go out of style. A jewel toned suit, like the emerald one above, is both sophisticated and stylish. Beyoncé shows just how powerful the pantsuit can be — maybe you can cop one in time to wear to the polls on Nov. 8.